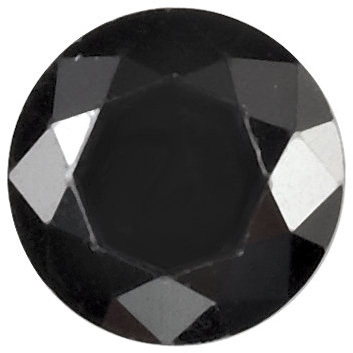 Black Cubic Zirconia Round Cut Stones This Round, radiant faceted Black Cubic Zirconia Displays a Bright Black Color and has a Very Good Cut. It has a clarity rating of Eye Clean Plus (VS), meaning that it can have very minute inclusions that can only be seen with the aid of a microscope. NOTE: Be sure to select the RIGHT gemstone/diamond by millimeter size only. Selecting your gemstone/diamond by carat weight is NOT ACCURATE. The best way to select the right size gemstone/diamond is to use our size chart image or consult with a local jeweler to measure your setting or gemstone. Black gemstones add a sleek elegance to custom jewelry designs. For example, you can use small sized round black cubic zirconia in place of diamond melee to create a pave look, for example you can use the small sized stones along the band of a ring. These gems will add a bold and edgy look, yet black cubic zirconia offers the same classic elegance of black diamonds. Another fun usage of black cubic zirconia is pairing it together with white cubic zirconia to create a lovely black and white look. Since black matches everything, the possibilities are endless, and black zirconia is the perfect low cost option for adding a pop of black into any custom gemstone jewelry piece. AfricaGems is the best place to buy black cubic zirconia gemstones. We offer competitive pricing, FREE shipping and a generous 30 day return policy. 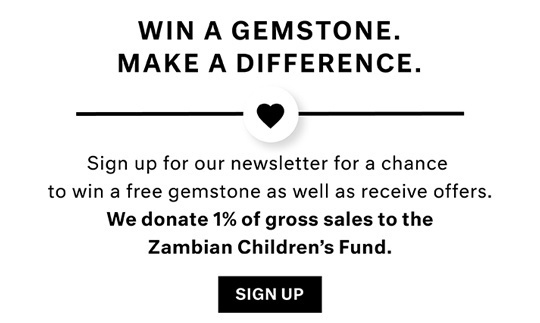 AfricaGems is the trusted source for both genuine and non genuine gemstones.